Learn how to choose outdoor furniture, select new decking and light up your exterior spaces. All in this issue of BRIGHT IDEAS. Composite decking: Colors, textures, and installation methods have definitely improved the state of composite decking, which consists of hardwood fiber and plastic. They offer a range of grains and colors to resemble wood. While composite materials are more expensive than wood, they also save the cost of yearly maintenance. Powder coated aluminum: What aluminum lacks in warmth it makes up for in cost and maintenance savings. Wood: Hardwoods remain a popular deck choice. Choices include redwood, cedar, and cypress, among others; pressure-treated lumber also works well, but look for treated wood free of arsenic. In addition, you’ll probably want to paint or stain the deck to increase its lifespan. No matter what material you choose, remember that decks, designed well, can add endless seating options that invite conversation and community among friends and family. “Try to create a multi-level experience that invites outdoor hospitality,” says Kinder. Want to get more use out of your deck? Extend its cool-weather life with food warmers and radiators, says Carolyn Kinder. “It’s a special way to add another level of living to the home,” she says. Make your deck easier to use by integrating lighting that works on steps, along railings, and at each level of a multi-tiered deck. “You need to make sure stepping from stairs and between levels is easy to navigate, says Kinder. I got an old wicker furniture set from my parents. Even though it’s been on a covered porch for 10 years, it’s still showing its age. Should I refurbish or replace? That depends on where you’re going to use it. If it’s really and truly wicker, which is made from rattan, split reed, or coated paper, it needs to remain in a covered outdoor spot. To give it new life, simply clean deeply with mild soap, apply primer, and paint. The cushions are likely to need updating. To make new slipcovers, look for outdoor fabric. 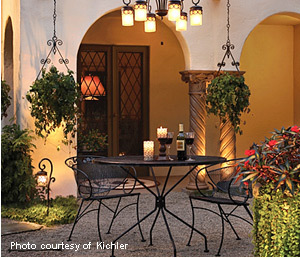 Exterior lighting can take ordinary patio furniture and transform it into an extraordinary gathering space. And if you’re installing new landscaping, hardwiring systems and installing control panels at the same time can decrease any future expenses while increasing your outdoor room’s ambience. The same rules of layering light apply indoors AND outdoors. You’ll want overall lighting, task lighting, and accent lighting – a chandelier overhead, sconces close to tables and chairs, and lighting around plants, for example. Use lights in trees, under the leaves of potted plants, and as edging for pools. Provide task lighting around the grill area, but choose a fixture with a metal shade, suggests Kinder, to avoid adding too much glare to the surroundings. Here are some easy ways to light an outdoor room that fits your life, your style, and your budget. Include lights that follow the steps or go between levels, whether ground or deck. Add lights for safety near front and back doors, garage doors and along paths. Consider an automated control system that turns on lights with a timer and allows you to adjust light levels from outside and in. Provide motion lights over rarely used doors, such as a basement access. Have porch posts wired for lighting. You’ll add ambiance and a unique touch to your patio. Include lights off the deck and patio, as well in garden nooks and along walkways. Add uplights against unique plants or interesting trees to up the drama factor in your garden. Consider solar powered fixtures. You’ll take advantage of a natural resource that’s free to boot. Match the style of your lights to the style of your house. You’ll carry the design theme from indoors to outside. Perhaps your yard goes on for miles, or maybe it’s simply a sliver of green in an urban landscape. It doesn’t matter the size, suggests Carolyn Kinder, veteran industry designer and international product developer for the home. It’s being outside that’s important. “People enjoy extending their living time outdoors,” Kinder says. “There’s a good feeling about being outdoors.” Here are some simple ways to create an outdoor room that fits your life, your style, and your budget. Make it easy. “The best part of being outdoors is the reduction in fuss in every single thing you do,” says Kinder. Let that lack of formality establish an easy style with informal groupings of furniture, for example, which invite easy conversations. “Mix and match it together,” Kinder says. Plan for the same comfort-inducing amenities you would on an interior room, such as ceiling fans on a covered porch. Make sure you choose one that is rated for exterior use. Plant something – anything. “Potted plants are an outrageously effective way to liven up a yard,” Kinder says.